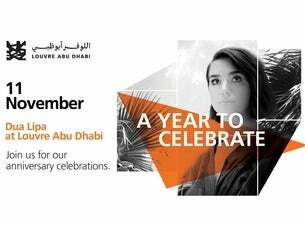 Don’t miss the epic close of our anniversary celebrations, as pop sensation Dua Lipa performs LIVE at Louvre Abu Dhabi on 11 November. Join fans from around the world to enjoy some of her biggest hits and electric anthems, including ‘New Rules,’ and ‘One Kiss’. After a year of #1 hit singles, sold out shows and record-breaking streaming figures, Dua Lipa has become the biggest breakout artist in the world. Already collecting major accolades in 2018, including ‘most streamed female artist in the UK’, Dua scooped two BRIT Awards after being nominated in five categories, performed to 85 million people at the UEFA Champion League Football final and sold over 2.8 million albums and 32 million singles worldwide. Tickets are limited. Book now to experience this once-in-a-lifetime performance, celebrating an exciting chapter in Louvre Abu Dhabi’s history. Free entry to the museum included from 2pm for all ticket holders.